One hour S/E of Zürich,15th century, 4 ft. painted wood. After a fire in 1465 this gothic standing mother and child replaced a 9th-10th century Romanesque Seat of Wisdom Madonna lost in the flames. Baby Jesus holds a bird in his left hand. According to the local monks this eludes to an apocryphal story in which Jesus as a young child resurrected a dead bird. In Jungian psychology the Dark Mother is an archetype that is meant to help us, in a healthy way, to integrate into our psyche all that we fear. 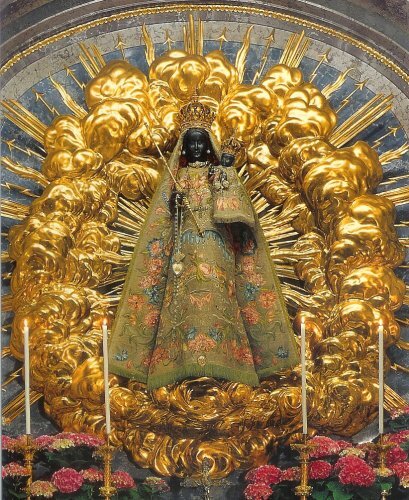 The famous Black Madonna of Einsiedeln, whose shrine is close to where C.G. Jung taught, seems to confirm that. Around the year 825 a German monk called Meinrad (about 799-861) became the abbot of a monastery near Zürich. But soon the holy man was drawn to live the life of a hermit. So he moved into the 'finster Wald', i.e. the deep, ominously dark, forest, the quintessential scary place of German language tales. The only thing he took with him on this journey into everything scary was a dark statue of Mother Mary. - To this day the Madonna of Einsiedeln is referred to as Our Lady of the (Ominously) Dark Forest, as if to remind us that when we set out to face our deepest fears, it is good to be accompanied by a dark mother. After Meinrad had spent thirty three years in the wilderness, two robbers came upon his hermitage. The saint knew their evil intentions, yet he welcomed them with open arms, gave them food and clothes. He only had one request: “When you have killed me, please light one candle at my feet and one at my head.” They proceeded to club him to death, but as soon as they had placed the candles according to Meinrad’s wish they lit up by themselves. Then the two murderers realized that they had just killed a great saint and fled in horror. Now Meinrad had two pet black crows as his companions, who had witnessed the deed and were known to the people in the area. They flew around the evildoers, making a racket, until the men were apprehended and "brought to justice", i.e. hanged. Maybe because of this violent end, nobody wanted to have anything to do with Meinrad's hermitage for at least 40 years. It was maintained only by the will of God until other monks were finally drawn there. By 934 enough hermits lived around Meinrad's old cell with the Black Madonna that it was decided to build a full fledged monastery. In 948 St. Konrad, bishop of Konstanz, arrived in Einsiedeln to consecrate the chapel that housed the old hermit's cell. The night before this solemn celebration was to take place, he had a vision of Jesus and the angels adoring the Queen of Heaven and consecrating the chapel. When the time came for the usual Sanctus prayer that contains the words: "Holy, holy, holy Lord, God of power and might … blessed is he who comes in the name of the Lord …" they sang instead: "Holy, holy, holy God before the face of the glorious Virgin … blessed is the son of Mary who comes in the name of the Lord…" The next day Konrad was still going to perform the usual consecration, but a voice stopped him, calling, "Cease, cease, brother, the chapel has been divinely consecrated." To this day the Sanctus is sung in Einsiedeln the way Heaven taught it. Making such a change at the heart of the mass, required bringing the matter before the Pope. In 964 a Papal bull confirmed Konrad's vision as true and allowed the changes for Einsiedeln. The story of its "angelic consecration" and the many miracles that followed it, earned Einsiedeln international fame. The statue was badly damaged during the time of the French Revolutionary occupation. After a year in a damp exile, the Black Madonna could return and was restored to her original whiteness in 1799. This caused such an uproar in the population that the restorer had to darken her again. He attempted a compromise of dark skin but with some color in the eyes, on the cheeks and lips, but the people weren't happy until he painted the whole face pitch black. That's the spirit!